“Dale paso al placer” reads the bottle label, which translates into “Give way to pleasure.” Obeying that would encourage me to give away the bottle. If the Panamanians (and other rums made in the light Spanish style), don’t up their act soon, I have a feeling they’ll be left behind in an era where tougher, more muscular, and more original rums — many of which are pot still based — are being made both by independent bottlers and more farsighted big distillers in other parts of the Caribbean. There’ll always be a market for standard strength rums – low price and easy sort-of quality ensures that every hormonal teenager and up-and-coming rum junkie usually cuts their teeth on one of them – yet I believe that the emphasis is slowly shifting from buttercup to beefcake: they are the new premiums, and margins will shift to favour them…and those who don’t get with the program may very well find their rums relegated to third tier supermarket tipple. 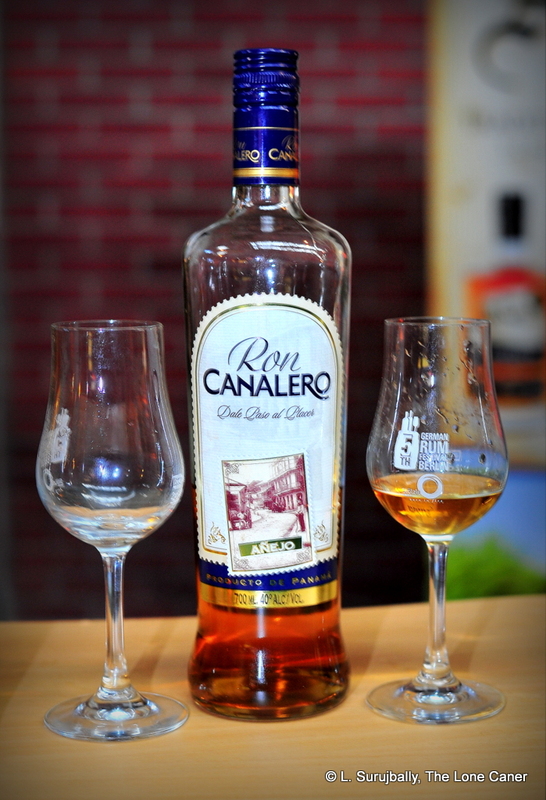 These were the thoughts running through my mind as I sampled the Canalero Añejo, which was a 40% Panamanian rum bearing Don Pancho Fernandez’s fingerprints. That’s no surprise, since he is the master blender for SER Alcoholes, the company that makes it. SER Alcoholes, whose name is nowhere noted on the label of the rum, is a group of companies now owned by the Grupo Pellas (SER stands for Sugar, Energy, Ethanol, Rum so an “E” is missing there someplace) and operates out of Las Cabras de Pese in Herrera Province in south central Panama where their plant is located. As far as my research goes, it’s a column-still rum based on molasses, and there’s little information online about it beyond that, not even age (I was told it was three years old). In the smell and taste of this rum, there were aspects of many other Panamanians coiling beneath, somewhat dampening down any originality it may have possessed at the inception. Take the nose: simple and straightforward, spicy and clear, with little beyond some molasses, light citrus and a few fruity hints (mostly raisins and ripe cherries). The palate was also similar in this way, with more sweet molasses, again some fruitiness of cherries and raisins, perhaps a flirt of vanilla, and even less citrus than the nose. It was extremely light in texture, hardly worth remarking on, had no real complexity or distinctiveness – it was tough to come to grips with because there was so little going on. Five minutes after I tasted it I would have been hard pressed to pick it out of a lineup. Even the finish was like that: short, easy, indistinct and very forgettable. In other words, a young pup, the runt of the litter, which enthused me not at all, not because it was bad, but because it just didn’t have much of anything. To me, this is a commercial supermarket rum for those who just want to go on a bender without major effort or expenditure. It’s soft, it’s light, it’s a rum and beyond that, quite unremarkable. The Ron Maja, Ron de Jeremy, and the Malecon 1979, for all their similarity, were better, the Abuelos were a step up, and the independents’ wares are a class apart entirely. There are a lot of Panamanians which I’ve enjoyed over the years, many of which are decent markers of the style, reasonably well made, soft and easy to drink. Don Pancho is more or less the poster boy for the entire country because of his extensive consulting work and advice provided to various makers from there. But perhaps no one person, no matter how esteemed, should have such an outsized influence on an entire region’s production because what it results in is a quiet weakening of true innovation (such as is exemplified by the various distilleries of Jamaica and the French islands, who seem to enjoy making whatever crazy hooch they feel like on any given day while squabbling for bragging rights amongst themselves); and that makes many Panama rums subtly like all the others, with variations being almost too minor to matter – you taste one, you’ve tasted most. Hardly a recipe for maximizing sales or energizing the tippling class to buy every one they can lay hands on. With respect to the Canalero Añejo, trying it once was quite enough for me since this is a rum where nothing much really happened. Twice.